Private lessons are an excellent way for players to rapidly improve their game through a one-on-one coaching experience. Our experienced training staff offers private, individualized instruction to players of all ages and skill levels. Whether you are a middle school or high school player hoping to make your school team, a club or varsity player trying to make a collegiate team or an adult player trying to improve your skills for league or tournament competition, our training techniques will help you reach your goal and gain a performance edge. Just tell us what skills you would like to improve, or allow us to assess your play and decide for you, we will make you a better volleyball player. 1 on 1 training is about the repeat of motions. When you train with one of our Elevate coaches you wont just be repeating your motions but you will also be able to see on film what it is that we are trying to achieve. Current available times are Sundays 2pm-3pm, 3pm-4pm, 4pm-5pm, 5pm-6pm. 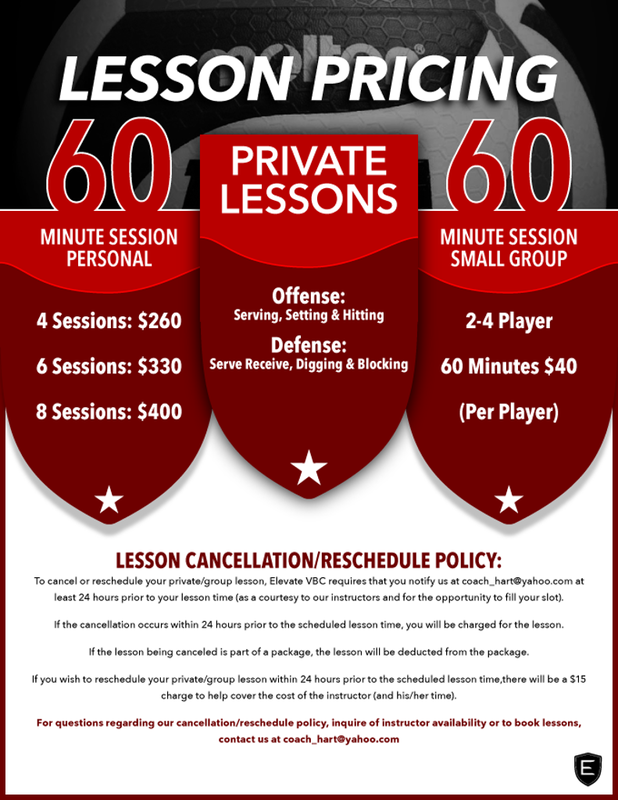 To cancel or reschedule your private/group lesson, Elevate requires that you notify us at coach_hart@yahoo.com at least 24 hours prior to your lesson time (as a courtesy to our instructors and for the opportunity to fill your slot). If the lesson being canceled is part of a package, the lesson will be deducted from the package. If you wish to reschedule your private / group lesson within 24 hours prior to the scheduled lesson time,there will be a $15 charge to help cover the cost of the instructor (and his/her time).